Closing down signs sit in the window of Toys “R” Us in New Kent Road on February 19, 2018 in London, England. Geoffrey the Giraffe, 1969-2018, purveyor of material joy. After fighting an unwinnable battle against online retailers and the lasting consequences of its own gross debt mismanagement, Toys “R” Us is finally closing up shop in the US. Though the company at first planned on trying to keep some 700 stores across the globe open after filing for bankruptcy last year, the retail giant pivoted suddenly when it filed for liquidation last week. According to USA Today, all remaining Toys “R” Us locations in the US will start clearing their inventory with massive price cuts on basically everything in the store, with most locations beginning their sales tomorrow, March 22, and running through June. It’s an excellent opportunity for anyone to pick up whatever toys or games they might have been holding off on, but the sale also marks the end of an era for many people who grew up with Toys “R” Us being the destination for any and all things collectible. Pour one out for Geoffrey, folks. 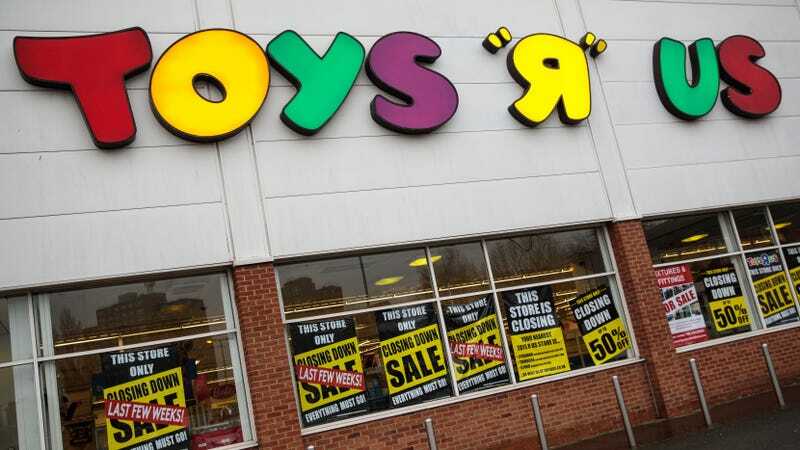 Update: Though it was widely reported that Toys ‘R’ Us’ liquidation sales were slated to begin today, multiple people were met with signs stating that that’s not the case because the actual date of the sales has not yet been settled. When I spoke with multiple Toys “R” Us associates at various stores today, they gave me similar responses suggesting that while the sales might not begin today they are still supposed to be happening at some point.